WILL & GRACE returned from a nearly 2-month break. NBC: THE TITAN GAMES dropped 0.1 to 1.1. BROOKLYN NINE-NINE lost 0.1 from last week to 0.8, then WILL & GRACE returned up 0.1 from its December 6 airing to 0.8. SVU held at its last original’s 0.9. ABC: GREY’S ANATOMY rose 0.1 to 1.7, and both A MILLION LITTLE THINGS (1.1) and HOW TO GET AWAY WITH MURDER (0.6) were steady. CBS: Returning from a rerun week, THE BIG BANG THEORY was up 0.1 to 2.4, and YOUNG SHELDON rose 0.2 to 1.9. MOM climbed 0.1 to 1.3, and FAM was at 1.0 compared to last week’s 1.0/0.8. SWAT remained at 0.9 after 2 weeks off. FOX: GOTHAM gained 0.1 to 0.7, and THE ORVILLE was steady at 0.7. 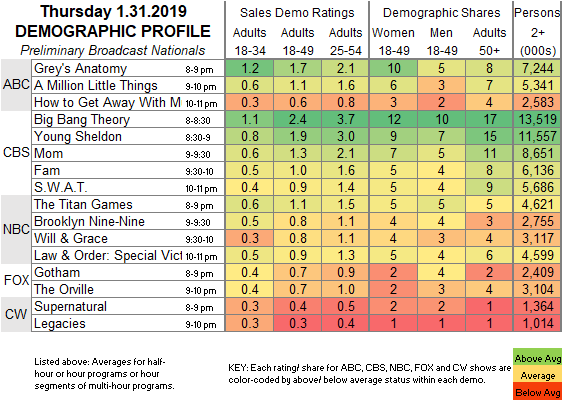 CW: The newly-renewed SUPERNATURAL (0.4) and LEGACIES (0.3) stayed at last week’s numbers. 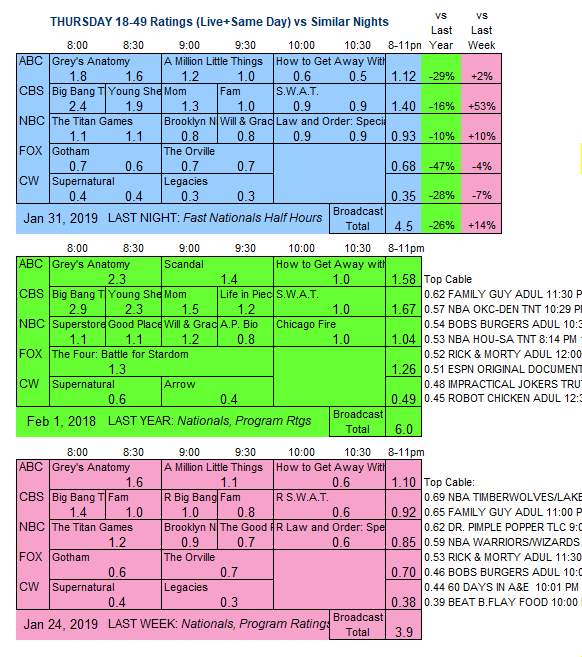 The networks have their regular line-ups in place tonight.